March 1, 2016 marks ten years since the United States’ free trade agreement with Central America and the Dominican Republic went into effect in El Salvador. CAFTA-DR or CAFTA for short, as it is known in the US, ushered in a decade of deteriorating economic conditions for working people, major new threats to the environment and national sovereignty and the further unraveling of rural economies. President Tony Saca from El Salvador’s right-wing Nationalist Republican Alliance (ARENA) party was the first president in Central America to ratify and to implement the Bush administration’s major trade policy initiative. On this inauspicious anniversary, CISPES honors and pays tribute to the labor unions, environmental organizations, women’s movements, indigenous, land-rights and campesino groups throughout Central America who waged sustained and powerful opposition to Bush’s “NAFTA for Central America.” We honor the memories of Juan López and José Sanchez Gómez, members of the Campesino Unity Committee in Guatemala who were killed by state forces while blocking the Inter-American highway to oppose CAFTA’s ratification. 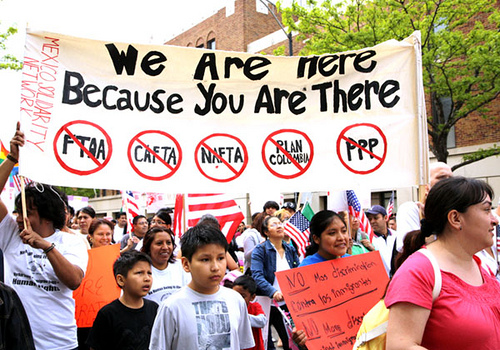 The well-organized resistance to CAFTA in Central America – which modeled itself in many ways on the cross-border organizing that was successful in beating back the US’ proposed hemisphere-wide Free Trade Area of the Americas (FTAA) – inspired solidarity action from the Central American social movement’s counterparts in the United States, who mobilized enough pressure to almost defeat it in the US Congress. 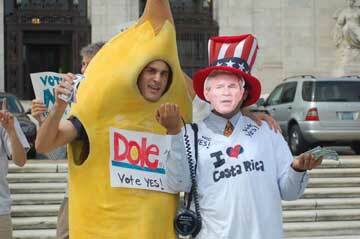 (Check out CISPES' former Director Burke Stansbury in the banana costume at a creative street protest before Costa Rica's ratification vote!) Approved in July 2005, the vote of 217-215 in the House of Representatives was the slimmest margin in history for a trade agreement vote. Though their prediction about CAFTA’s consequences was heartbreakingly correct, they’ve stayed true to their commitment of resistance. 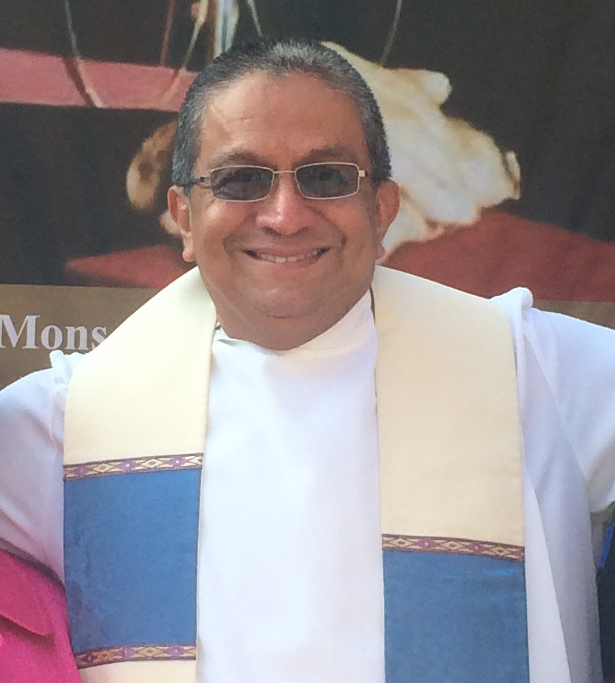 Over the past ten years, the Salvadoran social movement and the FLMN have continued their struggle to put the brakes on the expansion of the neoliberal model under CAFTA, for example, protecting public services like water, heath care, education and public security from inclusion in the US-backed “Public-Private Partnerships” law. Since the FMLN was elected to the executive branch in 2009, government officials have also backed communities organizing to defend their natural resources, for example, by refusing to authorize mining permits to corporations vying to extract gold and silver from the country’s soil. However, as expected, transnational corporations have responded with unprecedented aggression, using new legal weapons offered by CAFTA and exploiting the sweeping rights it grants them. As the Institute for Policy Studies has documented, “Transnational corporations in the extractives sector are increasingly turning to international arbitration tribunals to resolve resource disputes” as a result of the Investor-State Dispute Settlement (ISDS) mechanisms that are written into free trade agreements and bilateral investment treaties. One of the most egregious examples is the Canadian mining company Pacific Rim’s pursuit of hundreds of millions of dollars from the government of El Salvador through the World Bank’s International Centre for Settlement of Investment Disputes (ICSID). In the summer of 2014, the increasing number of children and families fleeing poverty and violence in El Salvador, Guatemala and Honduras brought the US government’s false promises that CAFTA would be a boon to the Central American economies back into the spotlight. As Congress debated a response, Rep. Marcy Kaptur (D-OH) convened a panel of trade justice and labor movement leaders to discuss the economic underpinnings of migration in the Americas. He noted that agricultural imports to El Salvador, Guatemala and Honduras have increased 78% since CAFTA took effect, representing a major threat to the livelihoods of small family farmers, as predicted by CAFTA’s opponents. In El Salvador the US State Department has also used CAFTA to try to undermine the FMLN administration’s successful Family Agriculture Plan, which has already begun to resuscitate the rural economy. Ultimately, Beachy, concluded that CAFTA has "contributed to the economic instability feeding the region’s increase in violence and forced migration." Read the testimonies of Manuel Pérez Rocha from the Institute of Policy Studies on mining and environmental destruction under CAFTA and Walker Grooms from Witness for Peace on state repression against campesino and indigenous communities in Honduras who are defending their land from destruction by foreign investors. Stay tuned for more analysis from CISPES, our long-time partners from the Stop CAFTA coalition and the resistance on the ground in Central America as further reports on CAFTA’s devastating impact ten years in are compiled.